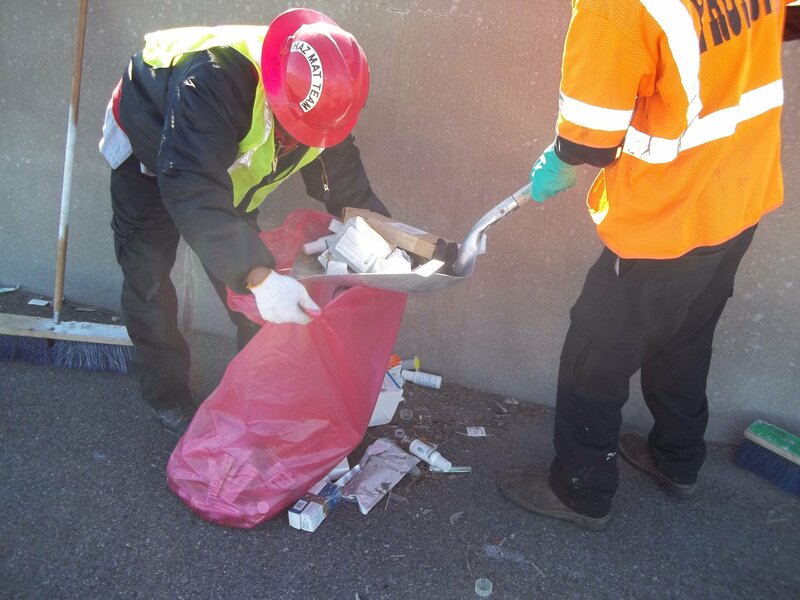 Protect team removes medical waste illegally dumped on a North Texas roadway. Healthcare facilities are a common sight across the landscape and are essential to the health and well-being of the public. These facilities produce many types of waste during the process of treating patients. These facilities will commonly generate municipal solid waste, hazardous waste and radioactive waste, along with a type of waste specific to healthcare facilities called medical waste. Regulations from the TCEQ and EPA regarding medical waste are meant to limit the improper disposal of medical wastes and infectious materials and mitigate the potential harm to the public. OSHA also sets regulations for how employees should handle wastes. Healthcare facilities that don’t follow regulations or don’t use licensed disposal contractors are not only risking human health, they could also face harsh penalties from regulatory agencies. The following are a few essential points to know about medical waste management. The broad answer is that medical wastes are produced at healthcare related facilities and pose a risk of spreading infection. Nursing homes, primary care offices, dialysis centers, hospitals, dentists’ offices and veterinarians fall under this category. As with most places of business, these facilities will produce regular trash and medical wastes that would include bodily fluids, feces, body parts, sharps (used needles) and any materials contaminated by them. The Texas Administrative Code states that hotels and private dwellings are not considered health care facilities and thus are exempt from most of the standards set by regulators. Used needles, razors and other disposable utensils that can easily poke or cut protective clothing and skin are called sharps. Healthcare facilities that use sharps collect them in disposable containers, often plastic, that protect employees and patients from injury. Most of these containers are not meant to be emptied and reused so attempting to do so can be extremely dangerous. Employees should also place sharps directly into the container after use and never attempt to recap them. How should medical waste be stored? Medical wastes in general are required to be stored in a secure container that limits its exposure to animals, people and the weather. The waste must also not provide a breeding area for insects or give off noxious odors. Many medical facilities will seal wastes in durable bags and place them into plastic tubs or corrugate boxes. Bags, boxes and plastic containers are usually red or yellow and should the proper labels identifying them as biohazardous or medical wastes. Most landfills cannot accept untreated medical waste so it is usually handled in one of two ways: incineration or autoclaving. When waste is incinerated, it is burned by fuel fed devices and reduce the waste to ash or slag, rendering it inert. When a waste is placed in an autoclave, heat and pressure are applied to destroy any microorganisms. Both methods sterilize the wastes and eliminate the risk of an infection spreading to anyone who comes into contact with the waste. After medical waste has been treated through either method, it is safe to place into landfills. Whether you work for small private practice or a large health care system, Protect Environmental can help you navigate the regulations and find disposal solutions that meet your facility’s needs. We take pride in helping our clients get their waste to the appropriate facilities and keeping it out of the environment so after contacting our office we’ll work hard to keep your organization in compliance 100%.